running the playoff probability calculations. Last week was an interesting one for sports fan who enjoy peeking behind the curtain at the world of high-stakes front office decision making. In one article, James Mirtle explained how the Penguins relied on advice from an outside analytics agency to make the trade that brought James Neal to Pittsburgh. The data went beyond simple statistics to track where on the ice shots were coming from. Meanwhile, NBA teams like the Toronto Raptors are taking things a step further. The franchise recently gave Grantland a tour of the proprietary tools they've developed based on SportVU camera technology. The software allows the team to track player movements and analyze performance in intricate detail. Some saw that post and concluded that hockey is still trailing basketball when it comes to modern technology, but I'm not so sure. 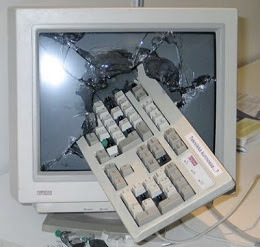 According to sources, several NHL teams are using computers to varying degrees in an effort to find a competitive edge. Florida Panthers - Thought about developing a web-based database that could tell us everything we could ever want to know about each one our star players, but then realized somebody else had already invented WebMD. Detroit Red Wings - Are using a program that tracks their players wherever they are on the ice or, in the case of Niklas Kronwall delivering a bodycheck, two feet off the ice. Nashville Predators - Probably shouldn't have let Sergei Kostitsyn update all their software, since now they can't find the "No" option on the dialog box that says "Are you sure you want to quit?" New York Rangers - Have kept their best players in the lineup thanks to computer technology that lets them hack into private email accounts and find those photos that we wouldn't want anyone else to see, WOULD WE BRENDAN? Calgary Flames - Are still in excellent shape to contend for the playoffs yet again according to the high-end software they've relied on for all front office decisions over the past few years, a used PlayStation 2 copy of NHL 2005. Colorado Avalanche - Team sources say coach Joe Sacco spends hours every day on a web site dedicated to complicated hockey analytics and in-depth research, or at least they assume that's what that "Monster.com" is. Buffalo Sabres - Developed special software that can determine what every player on either team should be trying to do at all points during a game and it works perfectly, if you like looking at 39 little dots all trying to punch the one that's Patrick Kaleta. Philadelphia Flyers - Don't use any sort of high tech tools, unless you're willing to count the "Ilya Bryzgalov to English" feature in Google Translate, in which case we use them pretty much every day. Anaheim Ducks - Our IT department spent the entire offseason developing a top secret supercomputer that could provide in-depth analysis of all of today's modern performance metrics, and they made the most adorable sad little faces on Brian Burke's first day on the job when he destroyed it with a crowbar. Dallas Stars - Their biggest current technology issue is that Ray Whitney is cranky about all the younger player texting too much, which would be a funny "old man" joke except it's actually true. Carolina Hurricanes - Purchased some fancy analytics program that was supposed to help us devise new offensive strategies, but after trying out its suggestion to "try shooting the puck into your own net" we realized we probably shouldn't buy any more products from Brodeur Industries. Toronto Maple Leafs - Prefer to determine ice time with old-fashioned methods like this handy ranking chart on Randy Carlyle's clipboard which, in related news, we recently discovered he had been holding upside down. Ottawa Senators - Can simulate the outcomes of various strategic decisions using their specially developed cyborg version of coach Paul MacLean, which will be great as long as it doesn't achieve self-awareness and start going to games and sitting right behind the bench and oh god we're all doomed. Vancouver Canucks - Tried to prepare for a recent game against the Coyotes by using a simulation of goaltender Mike Smith, but every time they ran it the computer immediately went down. Phoenix Coyotes - Spent millions on software that would show the optimal positioning for every player on their roster, but every time they run it the screen just reads "Quebec City". 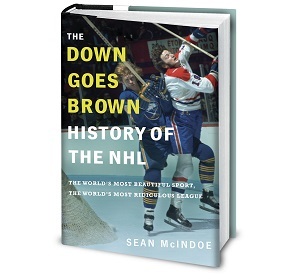 Featuring 70 posts including 24 chapters of exclusive new material, The Best of Down Goes Brown is now available. Is the Avs one a joke about their farm team? No...it's about Joe Sacco's job being in jeopardy. Oy, I forgot that "Monster.com" was such a thing. Oops. This is HOF material post. best one in a long time. Great post! I'm just happy my wife allowed me to read it. Wow, definitely some top choice DGB. The Sens one was classic. Also, I'm a Rangers fan and that totally has to be the reason why. Oh my God, that Avs one. Yes. I'd be bummed that there isn't a Columbus one, but I'm too busy laughing at the rest. Keep up the good work! How the hell did you know that the hurricanes were going to shoot the puck in their own net last night! The only way to make the first one more accurate would be to refer to them as the San Antonio Panthers. >200 man games lost in only 30 games. 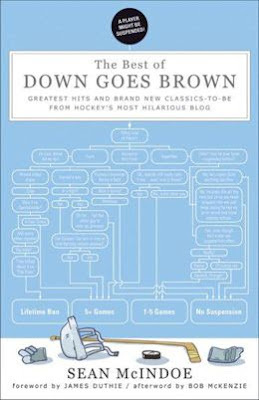 Team sources say coach Joe Sacco spends hours every day on a web site dedicated to complicated hockey analytics and in-depth research developed by Pierre McGuire, or at least they assume that's what that "Monster.com" is. Not sure if you are aware of this but the Washington Capitals actually make heavy use of a powerball machine, similar if not identical to the one used in the lottery. Bruce Boudreau used to put the numbers of the players on the balls and use it to make his line combinations. Adam Oates has used it in a similar capacity to decide who gets top line winger duty opposite Ovechkin. And George McPhee used it (with the names of free agents on the balls) to fill out the roster this past offseason.